When you’re shaking off the winter blues, a little sunshine goes a long way towards brightening your mood. Now, take it one step further and get behind the wheel of the Toyota 86 sports car and blow off the dust. The Toyota 86 is not new. In fact, it is a re-imagined Scion FR-S with a Toyota badge. This sports car may not be as well known as the Supra was, but it is making inroads with all age groups. The 860 Special Edition is geared towards those who are ready for some serious driving. Toyota took their motorsports history and used it to engineer this rear-wheel drive car using lessons learned on the track. They wanted to get your attention and put passion back into driving. The first thing they did was drop a 2.0-litre, 4-cylinder boxer engine under the hood in order to create their definition of “Pure Balance”. Boxer engines are compact and flat, and that helps to get a lower centre of gravity, which in turn, gives you road-hugging performance that helps to eliminate sway when swinging through corners. You get better low-speed torque, maximum output, great fuel-efficiency and more driving excitement. This engine can be matched with a 6-speed manual or automatic transmission, and it produces 205 HP and 156 lb.ft torque with the manual transmission. The Toyota 86 is aerodynamic and lightweight for speed and efficiency. Imagine how it feels going through the turns of a sweeping mountain highway as you lean into them with your hands wrapped around the wheel. This manoeuvrability and handling inspire confidence because you know it will respond to your every whim. The sport-tuned suspension delivers control and stability. Ventilated brakes ensure that you have stopping power when you need it. You don’t have to worry about traction because Toyota installed a Torsen® Limited Slip Differential in order to maximise your traction. When you need to downshift, the Dynamic Rev Management system provides you with quick, smooth shifting. It mimics the shifting of a manual transmission and the paddle shifters on the steering wheel give you a sport feel when driving. Toyota took their track experience even further and added Track Mode to their stability control system, which lets you drive the 86 to its limits before the Track Mode kicks in and helps you stabilise your car. This system makes performance serious business. Speed and performance are married to a safety system that offers a rigid tensile frame, airbags, tire pressure monitoring and the Toyota Star Safety System that includes Brake Assist, Smart Stop Technology and more. A backup camera offers a view of obstacles behind you. Naturally, the Toyota 86 is comfortable to drive, as well as fun. The front seats are bolstered for a snug fit that puts you very low to the ground for a true sports car feeling. The steering wheel is leather wrapped for grip and comfort. Of course, it is loaded with all of the latest technology that gives you a rich driving experience filled with your favourite music and apps via Bluetooth® connectivity. You have to stop by and take this sports car out on the road today. 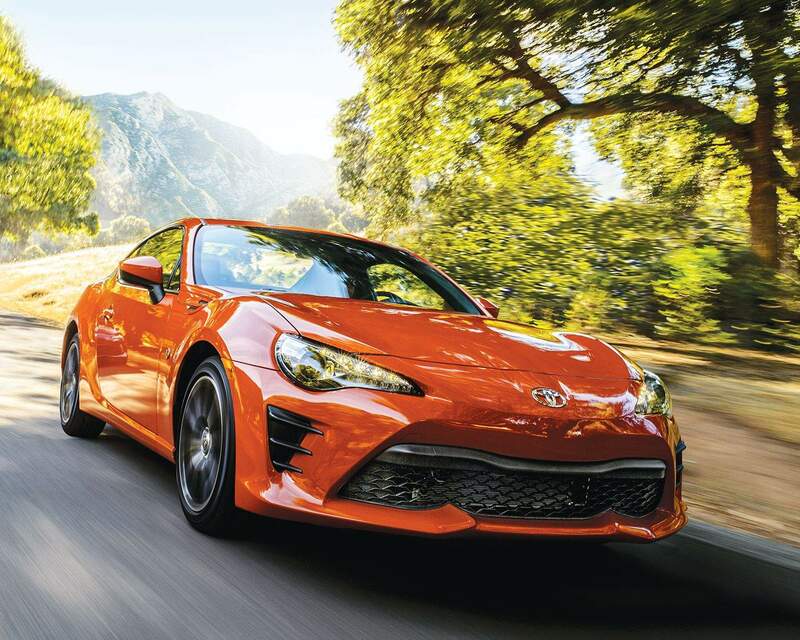 With warmer weather around the corner, it is time to think about doing some driving for fun, and there is nothing like taking the 2017 Toyota 86 out on the open road. Come by and see us today for the keys.